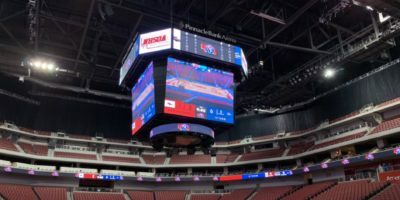 BOB’S HOUSE, LINCOLN – A class-by-class look back at State Championship Saturday from the NSAA state volleyball championships. In Class A, it’s all about the dynasties.Millard North is starting to look like the next one. Millard North swept its way to the Class A state title on Saturday at the Bob Devaney Sports Center with a 3-0 win over Lincoln Pius X. The Thunderbolts, trying to become the first team from Lincoln since 1998 to win the state title, put up a great fight, but was ultimately overcome by Millard North’s depth and talent. Pius X was the only team to score 20 or more on Millard North in at least two sets during the tournament. “This was the best three matches we’ve played all year long as an entire group,” Millard North coach Lindsay Peterson said of her team’s run through the state tournament. This makes two Class A titles in three years for Millard North to go along with a runner-up finish last year. Bellevue West won every Class A title from 1992-1997 before Lincoln Northeast and Omaha Marian each grabbed a title. Papillion-LaVista then rattled off three straight from 2000-2002 and Bellevue West went back into dynasty mode by winning all the title s from 2003-2006. It swung back to Papillion-LaVista in 2007 and 2008 and Marian got another title in 2009. Papillion-LaVista South then strung together three in a row from 2010-2012. Omaha Marian won three straight from 2013-2015 and now the dynasty label shifts to Millard North. It was a pair of seniors – Paige Holdsworth and Emmy Grant – that led the charge Saturday with 12 kills apiece and senior libero Emma Altman and middle Emma Grunkemeyer also played huge parts in the match, but there are plenty of young guns back for the Mustangs. Junior setter Izzy Lukens has established herself as one of the best in the state while Omaha recruit McKenna Ruch has been a huge force for Millard North since her freshman year and she had 11 kills, 12 digs and hit .348 in the state final. Eve Fountain and Molly Plahn are two big-time juniors that will likely make Millard North the front-runner when 2019 begins. Skutt Catholic won its fourth-straight Class B title on Saturday with a sweep of Elkhorn South in the championship match, accomplishing a feat no other team in Class B history has. 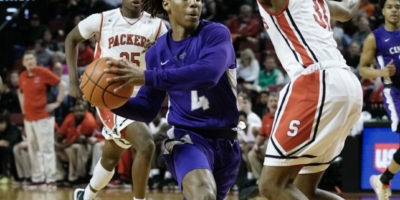 The Skyhawks now find themselves in pretty rare company, with only four teams in state history having won more than four straight state titles. Skutt Catholic is now tied with Kearney Catholic (2012-2015), Guardian Angels Central Catholic (2001-2004), and Bellevue West (2003-2006) as programs to win four straight. 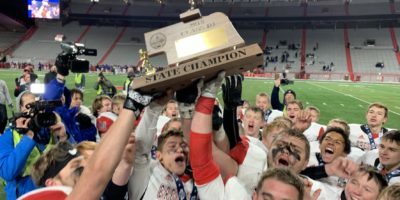 Only Republican Valley (1998-2002) and Columbus Scotus (1995-1999) have won five straight and the state record is six in a row, done by Shickley (1987-1992) and Bellevue West (1992-1997). Following the win over Elkhorn South, Skutt Catholic coach Renee Saunders talked about the process of building the program that has become so dominant in Class B. 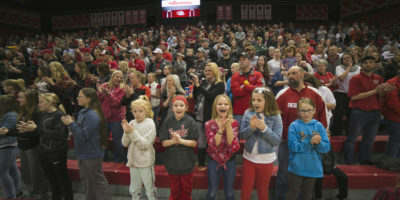 Class C-1 state volleyball championships aren’t for public schools. History will tell you that. When Wahoo won their first state title in 2017, they became just the third public school to capture the crown since 2000. In repeating on Saturday — in a wonderful five-set thriller against Lincoln Lutheran — they made it public schools twice in a row for the first time since 1992 and 1993. Before the match, coach Larson said, the Warriors took to heart their season motto of Fight On, in honor of Kim Brigham. A teacher at Wahoo and the mother of libero Kendal Brigham who lost a battle with cancer last summer. There were only two Wahoo seniors, and they are good ones. Elly Larson, the coach’s daughter, and Wayne State pledge, led the way for the Warrior attack with 20 kills and 25 digs in the championship match. She was at her best in game five with four kills including the game winner. 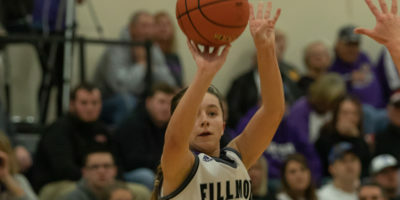 After tearing her ACL in the fourth game of Wahoo’s basketball season last year, her senior season was in doubt for a while. Her classmate Kyla Swanson will go to Illinois next year. She finished with nine kills and six blocks in the final match. But, it was Elly’s sister, Mya, who shouldered the load for most of the match. Just a freshman, she finished with 24 kills and 18 digs. Setter Elle Glock had 52 set assists in the match. But, still they needed that fifth set after Lutheran got a 25-21 set four win that evened the match. Wichita State commitment Marriah Buss was spectacular, leading Lutheran with 28 kills and a mind-boggling 80 swings. Lutheran coach Sue Ziegler said that Wahoo was on their game and tough to defend. The teams have split matches this season, each winning in 2-0 sweeps. That Blue Hill was even in the Class C-2 championship match against Hartington Cedar Catholic on Saturday was a small miracle in itself. Down 14-11 in the fifth set on Friday versus second-ranked Stanton, Blue Hill scored the final five points to advance to the finals. They were at it again on Saturday. Against the Trojans, Blue Hill had a 2-1 lead in set four but trailed 19-10 before coming back to win 26-24 for a 3-1 win and the first volleyball championship in school history. Rylee Kohmetscher had 14 kills and Emily Meyer 10 for the Bobcats, who finished 32-2. No one had a more impressive run to a state title than Fremont Bergan did in Class D-1. The Knights recorded three sweeps and allowed only first-round opponent North Platte St. Pat’s to reach 20 in a set. On Saturday, they topped Humphrey/Lindsay Holy Family in the championship game 25-15, 25-18, 25-14 behind 14 kills from Lexie Langley and 12 from Allie DeGroff. Bergan finished 33-4 with losses to Lincoln Lutheran and Bishop Neumann each twice. It was the first state championship for the Knights. Bruning-Davenport/Shickley nearly lost Macy Kamler in late September. 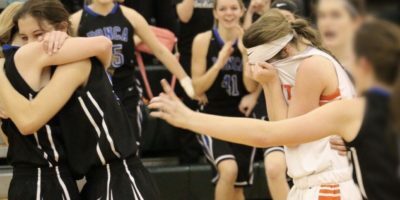 But, when she came back the Eagles set their sights on a Class D-2 state championship. They finished their mission on Saturday morning winning a five-set thriller over Ewing, including 18-16 in the fifth set. They didn’t win it, however, until their seventh match point after leading 14-11. The Eagles dream season finished 30-4; three of those losses without Kamler. It was also coach Kari Jo Alfs’ 100th win with BDS. Kamler was life-flighted to Children’s Hospital in Omaha on September 26 after being diagnosed with toxic shock syndrome. “(It was) a very, very scary situation coming out here and knowing that I’m in God’s hands and I can do it all; so thankful for doctors and medicine (and) it’s a great opportunity,” Kamler said through tears after the match on Saturday, getting a hug from teammate Jadyn Kleinschmidt. Kamler led the Eagle attack in the finals match with 21 kills and 15 digs, while Kleinschmidt added 18 kills and 21 digs. It was the first girls sports title in BDS co-op history after seeing the boys win multiple titles in football, basketball and track.